St. Petersburg, Russia’s former capital, celebrates its birthday on May 27. The city, which looks European but has a distinctly Russian soul, is a wonderful place to explore. 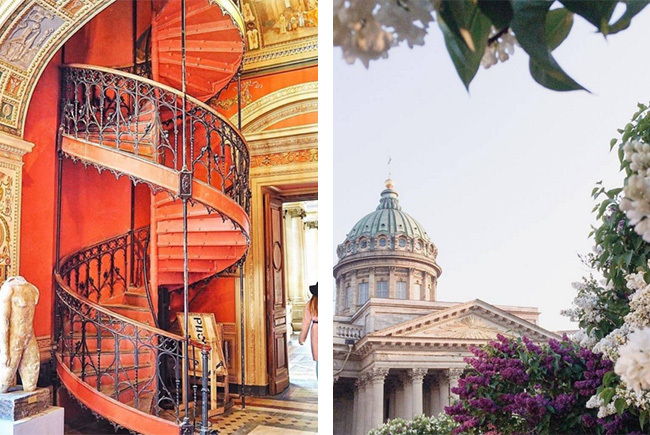 We present 5 Instagram accounts to follow so that you can enjoy St. Petersburg. @hermitage_museum In 2014 Hermitage was hailed as the best museum in Europe by TripAdvisor and is still one out of 25 best museums in the world. It is the best Instagram account to adore the pearls of Russian art. You will find gorgeously decorated halls, passages filled with marble statues, enthralled visitors enjoying masterpieces and the living symbol of the museum – local cats. @mskpit is an account showing both Moscow and St. Petersburg from interesting angles. You will be treated to glorious buildings, active street scenes, empty squares, gorgeous sunsets and unforgettable palaces. Soon you won’t be able to distinguish Moscow from St. Petersburg and will fall in love equally with both cities. @petrosphotos Every town has its own artist. New York has Woody Allen. Dublin boasts of James Joyce and Paris of Robert Doisneau. Photographer Alexander Petrosyan of St. Petersburg captured something special in the big-city bustle. He has been shooting his beloved city for 16 years, ever since taking up photography as a job in 2000. @yyamalovaa What is St. Petersburg? It is the legacy of Imperial Russia, wide boulevards, parks, canals and classical architecture. This account is dedicated to all those things, glorifying the beauty of each street and tiny alleyway. A recent, but already famous Russian song by the band Leningrad says, “Piter (St. Petersburg) is for drinking”. And this is more than true – St. Petersburg is well known all over Russia for its huge number of bars, special cocktails and loud parties. @betweenthebars_spb is maintained by an artist who displays her sketches of local establishments and their visitors.